"Can you write startling tales about these wax figures?" Paul Leni's Waxworks is today only in the second tier of well-known classic German films, but it is undeniably influential in its own way. As an added benefit, many of the greatest German actors are brought together in one anthology. 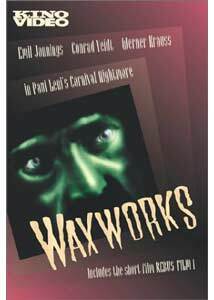 Although anthologies have their weaknesses, Waxworks at least plays with the expectations a little. A poet (William Dieterle) answers an advertisement for a writer at a waxworks. The proprietor (John Gottowt) wants descriptions of various characters in his wax museum, such as Haroun al-Raschid (Emil Jannings), Ivan the Terrible (Conrad Veidt) and Jack the Ripper (Werner Krauss). Entranced by the showman's daughter (Olga Belejeff), the poet sets to work and we see the stories he spins. The Arabian Nights segment featuring Haroun al-Raschid is by far the longest, eating up about half of the screen time. Played mostly for comedy, it features Jannings as a rotund caliph with an eye for the ladies. As is the case in all the stories, the poet manages to write himself and the daughter into each as lovers; here he fancies himself a baker in old Baghdad, robbing the palace while the caliph dallies with his wife. More serious and horrific is the Ivan the Terrible sequence. Veidt plays the mad czar as a feral menace, vicious to an extreme. He is quite terrifying and unpredictable in his interpretation. Winding up the anthology is the briefest segment, featuring Jack the Ripper (confused in the intertitles with Spring Heel Jack, an entirely different menace). This bit suddenly brings in German Expressionism, with weird angular sets contrasting with the flowing decorations of Arabia and Russia that preceded it. And who better to play a murderous creature in an Expressionist setting than Dr. Caligari himself, Werner Krauss? Unfortunately, he gets little to do and the Ripper character is only barely developed, making this highly anticipated segment one of the weakest of the picture, despite the artistic aspirations that it has. Dieterle is adequate as the lead(s) in the shorts. He would soon forsake acting and move to Hollywood where he would direct classics such as The Hunchback of Notre Dame (1939) and Portrait of Jennie. The Arabian Nights segment of this picture was the inspiration for Douglas Fairbanks' Thief of Bagdad (1924), which in turn inspired the classic 1940 Korda version—starring Conrad Veidt! I suspect that Waxworks was in the mind of the designers of the 1939 Wizard of Oz as well, since the chase in the Witch's castle there seems clearly modeled on a similar chase in the caliph's palace, and the witch's hourglass appears to have its origin in the enormous hourglass that Ivan uses to measure the lives of his victims. Jon C. Mirsalis provides a very pleasant piano score for the film, utilizing similar motifs in multiple segments, but in very different moods. Occasionally he plays some obvious games, such as brief quotations of the Russian national anthem during the Ivan sequence, but the score forms a nicely coherent whole that captures the mood of the action exceedingly well. Image Transfer Review: Two original release prints were utilized to make up the source material here. One of these prints is in gorgeous condition, with a ton of detail and texture present. The other seems rather beaten up, but is still quite acceptable. Happily, the inferior print only needed to be used for a few short sequences, mostly in the Ivan story. Occasional splices do not detract overly much. The film is color-tinted and runs at visually correct speed. There is frequent aliasing visible, however. This might have been a good candidate for an RSDL disc, to allow a little higher bit rate. Audio Transfer Review: The piano score sounds quite good, with harmonics plainly audible throughout, giving a very nice presence and immediacy to the sound. On the negative side, the track tends to be rather hissy, which I found to be distracting. Range is excellent. Extras Review: At the same time as Waxworks came out in 1924, there was a sudden crossword puzzle craze. Publishers grew out of nowhere (including Simon & Schuster) based on the sales of crossword puzzle books. Paul Leni created the first crossword puzzle movie, Rebus Film 1 (15m:28s), in an apparent effort to cash in on the craze. Offering clues in visual form, it's easy to see why it didn't catch on, but the film is certainly an intriguing little artifact. Unfortunately, the left side of the print presented here is slightly cropped off, resulting in initial letters being lost much of the time. However, the sense is always evident so this is a fairly minor annoyance. Finally, a brief segment of the Fairbanks version of Thief of Bagdad is presented for comparison; I don't think this particular scene demonstrates the influence as well as others I could name, but it's an entertaining little clip of Fairbanks in any event. An imaginative little anthology that is a bit out of balance, but Jannings seems to be having a good deal of fun with the material and Veidt is fabulous as the mad Ivan. Excellent source prints and a very appropriate non-synthesized score make this worth a look. The extras are mostly of historical interest only.